Houghton Mifflin Harcourt, 9780544991156, 240pp. Eva Hagberg Fisher spent her lonely youth looking everywhere for connection: drugs, alcohol, therapists, boyfriends, girlfriends. Sometimes she found it, but always temporarily. Then, at age thirty, an undiscovered mass in her brain ruptured. So did her life. A brain surgery marked only the beginning of a long journey, and when her illness hit a critical stage, it forced her to finally admit the long‑suppressed truth: she was vulnerable, she needed help, and she longed to grow. She needed true friendship for the first time. How to Be Loved is the story of how an isolated person’s life was ripped apart only to be gently stitched back together through friendship, and the recovery—of many stripes—that came along the way. It explores the isolation so many of us feel despite living in an age of constant connectivity; how our ambitions sometimes pull us apart more than bring us together; and how a simple doughnut, delivered by a caring soul, can become the essence of what makes a life valuable. With gorgeous prose shot through with empathy, pain, fear, and the secret truths inside all of us, Eva writes about the friends who taught her to grow up and open her heart—and how the relentlessness of suffering can give rise to the greatest joy. EVA HAGBERG FISHER's writing has appeared in the New York Times, T: The New York Times Style Magazine, Tin House, Wallpaper*, Wired, Guernica, and Dwell, among other places. She lives in New York City. "Eva Hagberg Fisher's story is the most beautiful sort of instruction manual. Through each harrowing, awkward, compelling, and heart-aching turn of the author's journey we glimpse the way a transformation is forged. Illness, addiction, and uncertainty are torments, but for some of us, asking for help can be the hardest challenge of all. This memoir is for us. It reminded me that every kind of healing is helped by the brave act of letting ourselves be loved. I would read it every day, if I could." 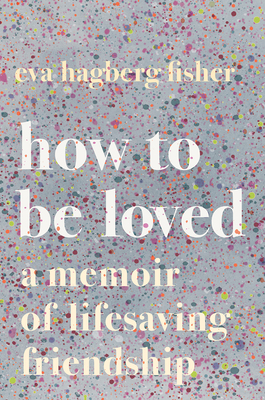 "Eva Hagberg Fisher's captivating HOW TO BE LOVED is more than a coming-of-age memoir that moved me to tears — it's also a fascinating medical mystery wrapped in a love story, but not the kind you're necessarily picturing. Hagberg Fisher shows us that the most deeply felt love isn't always romantic, that our chosen families can love us just as much (if not more) than our biological ones, and that sometimes, the hardest part of loving someone else is allowing them to love us back."